off the rails you might notice where the rails are in the first place and after that it’s up to you. Mary, contrary to everyones view of her, was now leading a fulfilling and respectable life. She closed her squeaking iron gate and carried her heavy bags up the path, proudly surveying her garden as she went. Sometimes being headstrong is a good thing. IMAGE (extract of railings outside the Royal Courts of Justice) BURNT ON WITH BLOWTORCH. 2004 and 2011. 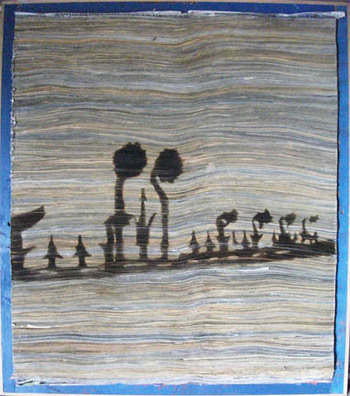 67.5 x 77.5cm.